Shrek tells the story of a green ogre whose quiet life suddenly turns upside down when fairytale characters get kicked out to the swamp by Lord Farquaad. 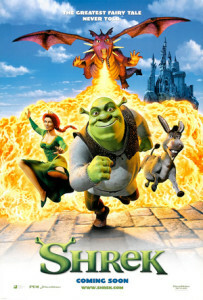 Wanting his old life back, Shrek decides to help the fairy tale characters with the help of Donkey. Farquaad on the other hand, tries to pry out from the Gingerbread Man the location of the other fairy tale creatures. His guards then come in bearing the Magic Mirror. The Mirror reveals to him that he marry a princess in order for him to be a king. He then resolves on saving Princess Fiona from the castle tower heavily guarded by a dragon. Shrek and Donkey arrive and challenge Farquaad. When Shrek and Turkey defeat Farquaad’s men, Farquaad makes a deal with them. He promises to let the fairy tale creatures leave the swamp if Shrek is able to rescue Fiona. When Shrek and Donkey go to save Fiona, Donkey ends up facing the dragon. The dragon falls in love with Donkey and brings him to his chambers. Shrek finds Fiona. Before they leave the tower, Shrek saves Donkey from the dragon. After they get out, Fiona is flabbergasted to see that her savior is an ogre. During their journey back home, Fiona sleeps separately from Shrek and Donkey. As days pass by, Shrek and Fiona become close and fall in love with each other. One night, Donkey discovers that Fiona turns into an ogre during night time due to the curse set upon her when she was just a child. Shrek overhears part of the conversation and misunderstands some things that Fiona said. Shrek gets hurt with the things that he heard. The group continues their journey until Shrek hands Fiona over to Lord Farquaad and leaves Donkey so he can continue living alone in his swamp. Donkey eventually comes to Shrek and confronts him. Shrek tells Donkey that he heard him talking Fiona about him. Donkey informs him that he and Fiona were talking about a different person and the he only misunderstood things. Shrek realizes his folly and apologizes to Donkey. Donkey forgives Shrek and tells him that Fiona is about the get married to Lord Farquaad. Donkey then helps Shrek to go to Fiona with the aid of Dragon. Before the wedding can conclude, Shrek arrives and reveals that Farquaad only wants to marry her so he can truly become a king. At that moment, the sun starts to set and Fiona turns into an ogre. Shrek finally realizes what Fiona was talking about herself before and Farquaad becomes enraged. He sets his men on killing Shrek and taking Fiona custody by Dragon then bursts in and help them. The movie ends with Shrek and Fiona’s confession of their love for each other. The curse on Fiona gets broken but to their surprise, Fiona is still an ogre to which Shrek has no problem at all. The movie ends with their marriage in the swamp where Shrek once vowed to live alone.